The Imatest Random Pattern chart is a variant of the Dead Leaves chart designed to measure texture sharpness.The Random pattern is the extreme pattern for noise reduction: it maximizes noise reduction while minimizing sharpening, improving the accuracy and robustness of measurements. In addition, gray regions to the left and right of the chart facilitate noise removal (using a technique where gray patch noise Power Spectral Density is subtracted from the signal + noise PSD of the central Spilled coins region). 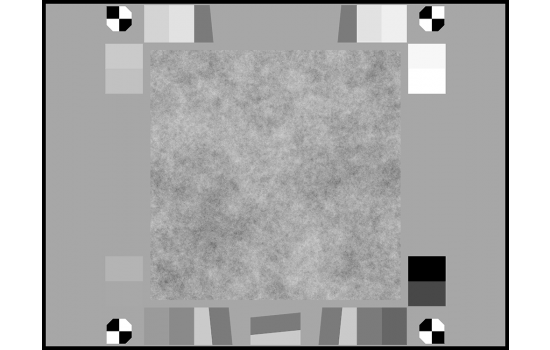 The gray area to the left and right of the random pattern has the same mean density as the random pattern, allowing it to be used for effective noise PSD removal using the McElvain et. al. technique. (High Precision Transmissive) 5.536" × 5.536"